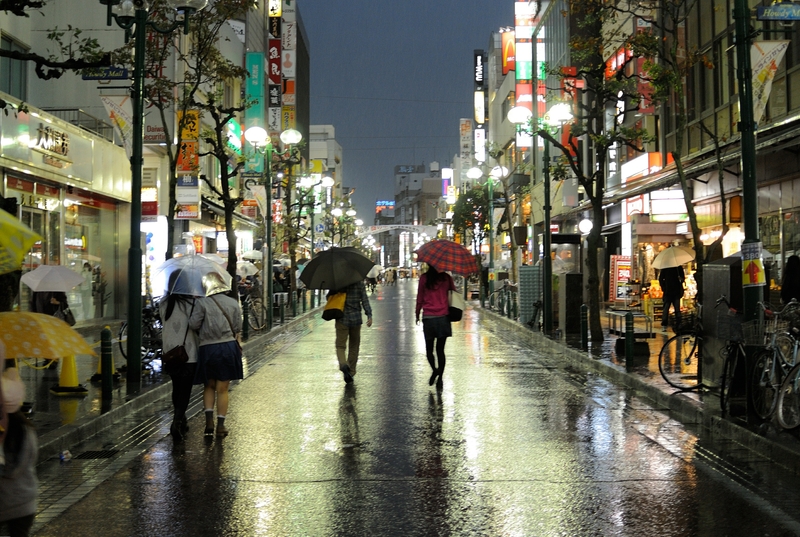 In Search of Murakami’s Japan. About this post: Japan as a travel destination has fascinated me for years, especially since I started reading books by Japanese author Haruki Murakami. As I finally head to Japan, this Japan travel blog post is dedicated to Murakami and his Japan – I hope to find places to visit in Japan inspired by Murakami. If you’re looking for essential Japan travel reading, start with Murakami’s books! Don’t you think it would be wonderful to get rid of everything and everybody and just go some place where you don’t know a soul? It was 2012 and I was on a long train ride along the Rocky Mountains in Canada. In the backdrop of the dramatic scenery outside my window, I savoured every word of Norwegian Wood, my first book by Haruki Marukami – a celebrated Japanese author. I remember laughing and crying many times on that train ride, my emotions surging with those of Murakami’s characters (Also read: Unlikely Books to Inspire You to Travel). Through his books, I’ve walked along the bright deserted streets of Tokyo in the wee hours of the morning; drunk craft beer on a warm summer day in the city’s upscale Ginza neighbourhood; indulged in intellectual conversations at a jazz bar in Shinjuku; sampled ramen in a traditional Japanese ryokan; and sipped whiskey by the fireplace, listening to music on an old vinyl record player, on a snowy day in Hokkaido. Through his books, of which A Wild Sheep Chase and Sputnik Sweetheart are two of my favourites, I’ve felt grow in me a mysterious yearning for Japan. An indescribable feeling, despite never having set foot in the country. After dreaming of Japan for years, I’m finally heading there… in search of Murakami’s Japan, but also my own. I arrive in Tokyo on March 5th; I’ll spend my first week exploring the Kantō region and the Japanese Alps on the mainland of Honshu – on assignment for the Japan National Tourism Organization, along with a handful of bloggers from around the world. We’ll be sampling some of Japan’s finest whiskeys at the foothills of Mount Kaikomagatake, seeking out “Ume” – Japanese plum blossom – in Akima, sneaking a peek at snow monkeys that descend from the cold cliffs to the Valley of Yokoyu River to bathe in the onsens (hot springs!) in winter, and indulging in the intriguing local cuisine, including unique Buddhist vegetarian fare. You can follow our adventures with #UndiscoveredJapan and #VisitJapan on social media. Getting my sushi on Mumbai – follow my food adventures at @nomadicvegan on Instagram! Over the following two weeks, I plan to explore the lesser-known island of Kyushu; this promises to be a region of extraordinary natural beauty, including active volcanoes, remote calderas, open grasslands and somewhat strange, nearly uninhabited forest islands. If you’ve been to Japan, I’d love to hear your recommendations on unique places to stay, interesting experiences off the tourist track and any vegan survival tips! Oh, and if you happen to know Murakami-san, I would love an introduction 😉 Arigatou Gozaimasu. Beginning of the cherry blossom season in Taiwan. What would you most like to read about from my month-long Japan trip? Follow my Japan adventures live on Instagram, Facebook and Twitter! *Note: I’ll be spending my first week exploring Japan on assignment for Japan National Tourism Organization. Opinions on this blog are always my own. I can’t even put into words how much I would love to make this trip as well..i would like to see as much of the Japanese people’s normal lives as possible. With each region being so different, I’d like a comparison of the daily rituals. Have an awe inspiring trip. And hopefully walk in the path of Murakami’s Japan. Thanks Trudy! The trip is off to quite a start; so many amazing encounters and stories to share. I can’t wait to blog all about it 🙂 Hope you’ll make it here soon enough! What a well written post, which combines two of my favorite things — travel and books. I have no doubt you’ll be able to immerse yourself in new experiences during your trip, and as you put it so well, discover Murakami’s Japan, but also your own. I love Japan! I’ve written about some of my travels throughout different parts of the country on my Damian Daily blog. Enjoy your adventure! Thanks Lisa! This has been a trip of so many “first times”; I’m loving it. Thanks for sharing your love for Japan 🙂 How fun that you went skiing there! I’d wholeheartedly recommend Daisetsuzan National Park and the remote corners of Hokkaido. And yeah, taking the train as often as possible. Don’t miss Hiroshima..It is a profound experience. Do it with a knowledgeable guide who will take you through the history. I think most of the dishes in traditional Japanese meal ( Kaiseki ) is Vegan except for Mizuho soup and some other meat thing.. Thanks for all the tips, Ajith; very helpful! I hope to make it Hiroshima at some point. Have a great time in Japan! Japan has fascinated me for ages and I hopefully make it one day with my family. I’ve been learning a lot about Japan and the tradition. I came to know that young generation is not marrying and are not interested in marriage. Government is worried about Japan’s future as the so called minelians are abondating the constitution of marriage and are just living single. Japan’s Govt. sees this trend as a threat for its future as it would bring foreigners into the nation and it would lose it’s authenticity in few decades. Can you find out why and if this would really put a dent in Japan’s culture and future in near future? Also ask what Japanese think about Indians, Indian weddings, Bollywood and so on. Do they fancy Indian and would they live or travel to India if they have an opportunity? I’m in rural Japan now and many people have almost never met other Indians! They do know namaste and curry though 😉 It’s true that fewer people are choosing to marry / have kids – which is causing an ageing population. I love Japanese writers and movies, so have made a note to search for Murakami’s books. My favourite all time Japanese movie is Departures. With a yearning for Japan, you’ll love it. I’m heading to Japan this year too, but probably in June. Enjoy your stay. That’s awesome Mallee; I hope you’ll enjoy it. I’m loving it so far! Thanks for the suggestion; I’ve made a note of the movie and will keep a lookout for it. I would love to hear how to manage vegan options in Japan. I don’t particularly relish the thought of the food there. I’ve been pleasantly surprised and had some INCREDIBLE vegan meals so far. It’s not always easy to explain vegan, but once you get it across, the food is just delightful. Sharing some live meals on Instagram @nomadicvegan and Twitter @shivya. how very well written post, all the best and enjoy Japan! u never know who will get inspired by your life experience, so keep sharing them. Thanks Reshmi, loving it so far! I had visited Japan in 2010 at invite of JNTO. At that time I was based in Hong Kong. The trip is still etched in memory. I had opted for basic cities Tokyo, KYOTO, Hiroshima, Hakone. All the best. That’s awesome! Which of those was your favorite? I’m in two minds about visiting Kyoto, but maybe for a couple of days I will. Enjoy, your trip. As I have dreamed as a young girl, ugh quite some years ago, visiting Japan. Since I have become a Buddhist, I would love to see as many Buddhist temples as you can visit. I’m hoping to try Zen Buddhist meditation; will keep you posted on the experience. Enjoy what you experience and see what fits you. Enjoy what you experience and what fits your own. It’s not always easy to explain vegan food, but I’ve LOVED most of what I’ve eaten so far! Shall write all about it at the end of the trip. Hey Shivya, you left my heart with a burning desire to visit Japan again. I went there on a solo trip to treat myself on my 30th birthday, I went only to Tokyo and the nearby Kamakura. Ofcourse you will take in the quirk of Tokyo but I would recommend getting lost in Kamakura too. I find Japanese people the most helpful which you will discover if you get past the grim faces and get them to talk. I have never read Haruki Murakami, would like to read now. Does he write in english or is it translated? I am however a fan of Keigo Higashino’s mystery novels, which are all translated into english. No doubt the novels are spell binding, but I cant help but commend on the quality of translation in these novels. Aww, I can imagine the nostalgia. I feel so surreal and yet immersed here that I would really never want to leave. Murakami’s books are translated too, but I think the translation is excellent. So worth reading! I’ll look out for Higashino’s. Hey, I would love to experience Murakami’s Japan too. It would be wonderful if you get to meet him. I’m so excited for you! We visited Japan in 2015, and found it to one of our best international trips. In particular, we visited Tokyo, Hakone, Kyoto and Hiroshima. We visited Nara and Himeji on side trips from Kyoto. In particular, we were taken in by the Japanese people’s willingness to help at every turn. They would see you looking at a map, and offer help. We even had a few instances where we saw people running towards us, because we left a piece of paper behind somewhere. We also particularly loved the scenic natural beauty, and the fact that Japanese people haven’t lost their culture inspite of influence from the west or in their quest to become an industrially advanced country. According to our experience, vegetarian food isn’t possible if you want to have Japanese food. However, because we mostly stuck to the big cities and the touristic areas, we got a lot of options for vegetarian food. Perhaps your experience may be different and you may find vegetarian food easily accessible given that Buddhism is strong there. Internet speeds are very fast everywhere, and so is the public transport system which is very efficient and intensive. Mumbai – Sushi koi (for delivery) and Kofuku are my favorites! Travel and books – a wonderful combination. Hope you are enjoying your travels. Do you plan to visit the Jigokudani Park? beautiful post ! lovely ! Previous PostOn Life and Detachment: A Conversation With Buddhist Monks in Thailand. Next PostJapan Tourist Visa for Indians: Requirements and Tips.